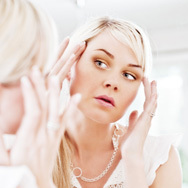 You look in the mirror and see the first signs of fine lines and wrinkles. They're around your eyes, your mouth, your forehead—and they're starting to set in. Or you haven’t been paying attention, perhaps trying to ignore these changes—but all of a sudden, they’re more pronounced. Depending on how much unprotected sun exposure you've had, fine lines and wrinkles can start showing up as early as your mid-twenties! Sunscreen rated SPF 30 or greater applied on a daily basis is the only way to reduce the risk of early signs of aging. This piece of advice you can take to the bank, it’s that valuable. The concern many of us have about wrinkles often results in lots of money wasted as you try to stop them from getting worse with overly expensive concoctions making misleading or unrealistic claims. Knowing women do this always break our hearts because there are better ways to go about looking younger and maintaining those results. We explain the reasons why skin wrinkles and what you can do via skincare to diminish their appearance (starting with sunscreen of course)—and help the wrinkles you see now virtually seem to disappear! Cumulative sun damage from not wearing sun protection every day, not seeking shade, and basking in sunlight with or without sun protection. Most experts would say this cause 80% of what we think of as skin aging, when it’s really sun aging. The lighter your skin color, the more vulnerable it is to serious sun damage when you aren’t wearing sunscreen. However, regardless of your skin color, unprotected sun exposure is still putting your skin at risk. Darker skin tones need sunscreen too! Every birthday marks the passing of another year and it actually has a technical term associated with it: chronological aging. Those years add up, a part of life even great skincare products and sunscreen can’t delay forever. Great skincare and sun protection can do a lot, but being realistic and dealing with facts is the best skin care recipe for everyone: As you get older, you will see more natural signs of aging that cannot be controlled or stopped. Midlife changes alter the texture and resilience of skin, changing its ability to bounce back as it once did. Skin becomes crepey and looks dull, uneven, eventually becoming more fragile and less sturdy. Again, sunscreen is your best friend to diminish the impact. Daily SPF application plus great skincare can go a long way to rejuvenating and enlivening skin’s appearance during this change. The parts of your face you use the most wrinkle the fastest and deepest. Your forehead, corners of your eyes, laugh lines that go from the nose to the mouth, the top part of cheek, and the lines between your eyebrows (often referred to as “the 11s”) are always the most evident. We aren’t telling you not to smile or frown, it’s just one of the facts we want you to be aware of. Disruption of skin's surface and its vital contents by years of using products that contain sensitizing ingredients or bad skincare habits. This includes smoking, which is absolutely terrible for skin at any age. Sunscreen is the #1 anti-aging product you can apply, and should be applying, every day (but you already knew we were going to say that right?). Protecting skin from UV light exposure needs to be at the top of any anti-aging skin care routine. And you can’t start to early: Daily use of broad spectrum sunscreen rated SPF 30 can absolutely reduce the risk of early signs of aging! Skipping this step in favor of only using other anti-aging products is a skincare mistake that many people make. Repeat after us: Looking younger begins with consistent use of a broad spectrum sunscreen rated SPF 30 or greater, all year long, no matter the climate or whether you spend time outside. Brilliant skincare products support the benefits you get from sunscreen; you need both, inextricably tied, to get the best skin of your life now and in the future. When it comes to what supporting anti-aging skincare products to choose or when it comes to solving any skin concern, it’s never as simple as what one ingredient or product can provide! That’s why in addition to sunscreen, research shows that the best defense is a gentle, complete skincare routine enriched with antioxidants, skin- replenishing ingredients, skin-soothing ingredients, and skin- restoring ingredients. The best products and skincare routines consistently and unfailingly provide these kinds of ingredients just as we do at Paula’s Choice. A leave-on, completely non-abrasive AHA or BHA exfoliant that exfoliates skin naturally and imperceptibly. Specialty products that contain ingredients proven to address specific signs of aging. These include high concentrations of vitamin C-, retinol-, hyaluronic acid-, and niacinamide-based formulas. You can also use peptide-infused products to help visibly firm skin and smooth the appearance of wrinkles. Carefully chosen skincare products that include lots of antioxidants, replenishing ingredients and skin-restoring ingredients can put back into skin’s surface what it has lost over time. These types of ingredients in a complete advanced skin care routine like can truly rejuvenate and revitalize your skin, making wrinkles much less of a visible concern. This is the best way to love your skin and resist the effects of time!